Dr. Jones, a native of Billings, attended Alkali Creek Elementary School, Castle Rock Middle School, and graduated from Skyview High School in 1995. He then spent two years serving the people of Japan as a missionary for his church. Upon his return he met his bride, Katie (also a Billings native). 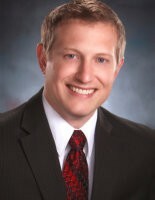 Dr. Jones continued his education at Ricks College and BYU before venturing to dental school at Case School of Dental Medicine in Cleveland, Ohio. He quickly became a die-hard fan of the Cleveland Indians as well as the Cavaliers and Browns and remains a fan today. Dr. Jones graduated from dental school in 2006 and joined the US Air Force to further his education with a residency in Advanced Education in General Dentistry (AEGD) at Offutt Air Force Base in Nebraska. During his residency, he became skilled in oral surgery, endodontics, periodontics, prosthodontics, and overall comprehensive dental care. After graduating from his residency, Dr. Jones developed his dental skills at Eglin Air Force Base in Florida where he provided dental care to military personnel and helped in the AEGD program. In the summer of 2008, Dr. Jones served our country by deploying to Kirkuk, Iraq. While in Iraq, he provided dental care to US soldiers as well as local Iraqi people. He also performed critical medical treatment helping to save life and limb of combat injured patients. Dr. Jones served above and beyond the call of duty, earning many medals and honors including the Air Force Commendation medal, the Army Achievement Medal, the Meritorious Unit Award, and the Iraq Campaign Medal. He was also fortunate to be able to serve in Operation School Supplies to help the children of Iraq get equipment they needed to attend school. After returning home safe from Iraq he continued his work at Eglin Air Force Base. While he loved serving in the Air Force, he knew it was time to come home to Billings. Ten years, six states, eight homes, and four children later, Dr. Jones returned home to Billings and became owner of Wicks Dental Clinic. If you are looking for an experienced Billings dentist, contact us today!